Once again it is time for the Skateboard Scotland Annual Gnarly General Meeting which will be held at The Space in North Berwick. The AGM will start at 3pm on Sunday 8th of December 2013 and should last about an hour or so in which we will get a summary of the past year, a summary of the accounts and the usual voting in of board members. After the AGM the Space are running a skate jam session from 5-10pm along with some live music from Daniel Waxoff and D.S.A so that’s another awesome reason to get along! I’m keen to know if there is anywhere around Fife that my 13 years old grandsons can get coaching. They are pretty much newcomers to the sport. Hi Tom, we’re not aware of anywhere in Fife in particular for coaching I’m afraid. 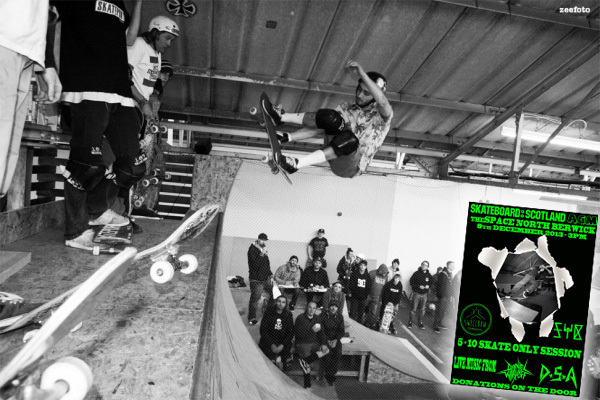 Coaching in general is an area that is being developed within Skateboard Scotland, one option perhaps is to approach some skateboarders at your local park to see if they are interested in helping teach the basics, otherwise contact your near indoor park such as Transgression Park in Edinburgh or EK Park in East Kilbride.